This post is in partnership with World Market. I never imagined entertaining in my 350 sq. ft. studio apartment. My sofa is five foot long and squeezed between my bed and my kitchen counter. I can barely turn around without knocking over a wine glass or bumping into a corner of my bed. But last month I finally got to a point where my apartment felt decorated enough. It’s not entirely done (is it ever? ), but my studio went from feeling like a work in progress to an actual home. It also happened smack in the middle of Thanksgiving—and my festive spirit was flying high. So I decided to host a holiday party for my co-workers. There’s only four of us on the MyDomaine editorial team in New York, so I figured it was manageable. It went really well! So well, in fact, that as soon as it was over, I was ready to host my next gig—a Christmas Eve soirée, perhaps? Or a New Years Eve party! 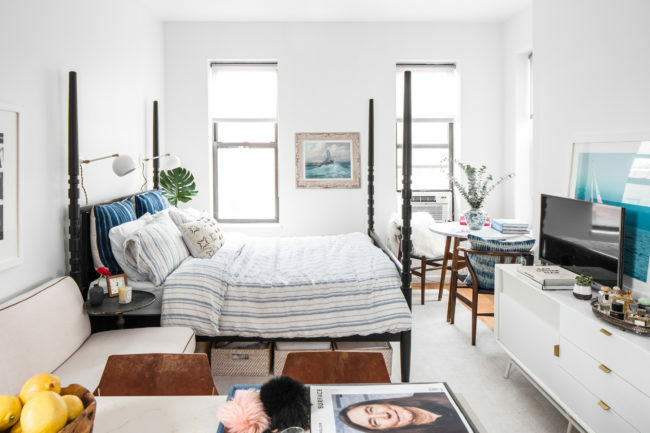 Because I’ve learned a thing or two from entertaining in my studio apartment ready—here’s what you need to know when throwing your own studio session. Keep everything simple: the guest list—keep it under 8, the to-do list, and the menu. I know, you’re probably dreaming of over-the-top oyster platters and croquembouches, but trust me when I say—the simpler, the better. When you have a studio apartment, stick to the items that can be eaten while standing up: small bites, cheeses, crackers, olives, nuts. No one likes carving a turkey with a plate on their knee. Stock up on fur throws and floor pillows to make everyone comfortable. I’m a fan of the kitchen parties, but there comes a time when everyone’s over eaten and want to lounge around. If you don’t have enough seating for everyone, create it with accent chairs, poufs, floor pillows, or even your bed. On that note: make your bed—and make it well: hotel corners, ironed sheets, fluffed pillows, and all. When tabletop space is limited, trays are a lifesaver for serving nibbles and drinks. While you may want to arrange a buffet station on your kitchen counter or console table, it’s handy to have the trays to move around the room as needed. Set the mood with low lighting, a scented candle, and festive florals. I loved this arrangement I got from The Bouqs—it’s varied, festive, and it smells amazing because of the pine leaves. It’ll make up for the fact that you don’t have a tree, a mantle, a collection of wreaths, or a hundred balloons stuck to your ceiling. This rule comes last, but it should really come first: whatever you do, make sure you have enough booze for everyone. This include (but is not limited to) a welcome cocktail, a signature cocktail mix for the night (with all ingredients and garnishes), beer, wine (red and white), and copious amounts of champagne, because—New Years Eve. BRING MORE THAN A BOTTLE OF WINE THIS YEAR. I’m all for bringing a bottle of wine at dinner—my mother always taught me never to show up empty handed. But since we bring wine at every dinner throughout the year, shouldn’t holiday dinners be extra special? Most hosts will go the extra mile to make a holiday dinner unforgettable, so it seems only fitting that we would follow suit with a great gift. Why not show up with a great bottle of olive oil, an ultra-luxe shower gel, or a great coffee table book? Here are a few of my favorite gifts for the host. Thanksgiving evokes images of bountiful spreads, hunkering down by the fire, crisp fall walks—and one place is seemingly the best place to do all these things. The newly opened Greydon House in Nantucket designed by Roman + Williams (of Ace Hotel fame) draws on the island’s history as a Colonial settlement where today, every rafter and paint color is inspected to respect the architectural integrity of the Greek revival shingle buildings that stand in this sheltered time capsule. Roman + Williams wasn’t about to jeopardize the local history and aesthetics—departing from their habitual edgy modern tendencies to create a place that’s integrally timeless—but not without an expertly curated aesthetic that’s firmly planted in the present. All this to say—I couldn’t think of a better place to get away for Thanksgiving than Greydon House—where one can sip on a cocktail at the bar, cuddle in blankets on the porch, read a book in the library, sleep in for hours, and taste the culinary delights of Michelin-starred chef Marcus Gleadow-Ware. What gifts are you getting for the men in your life this year? It’s my favorite time of the year again—gifting season! I’m kicking off gift guides with my favorite people to shop for this year—our favorite men. Maybe it’s because I get to do it so rarely, but I love shopping for men. Some people say they’re hard to buy for, I happen to think the opposite. 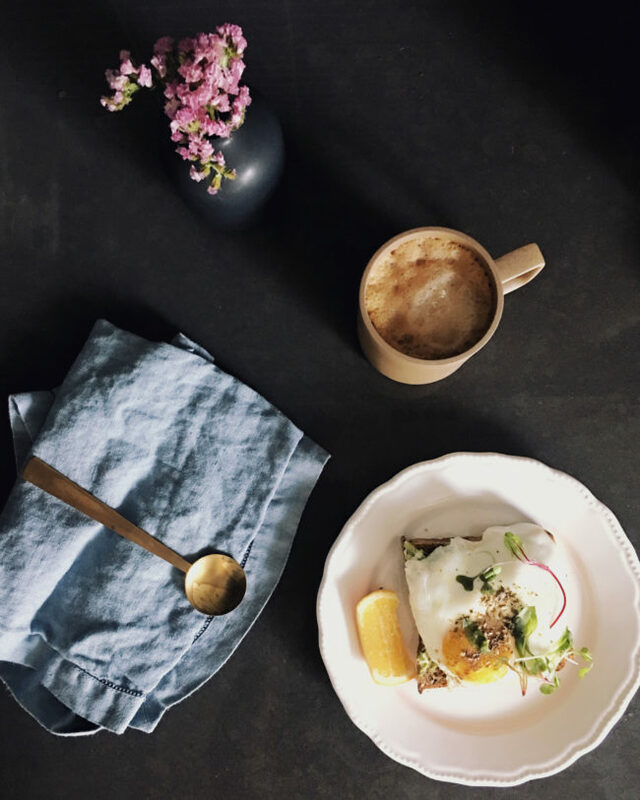 There are so many fantastic well-designed products out there to fulfill any interest your guy (or dad or brother) might have—maybe they’re really into photography, cooking, traveling or coffee. The key is to know what makes them tick and find the absolute best accessory to help them realize their passion. And if all else fails, anything cashmere or a bottle of Terre d’Hermès will do the trick.